Slimfold 1 Silver | Kanda of Japan | Reading Glasses Etc. Slimfold 1 Silver : Folding Reading Glasses. The original folding reading glasses from Kanda of Japan. Slimfold folding reading glasses are one of the most durable, compact, and copied reader styles made. They have been around for some time now and we are happy to be able to offer them. 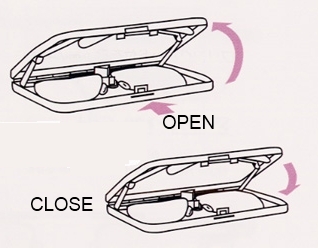 They are different in many ways to other folding readers in that they have a spring action frame that collapses into a small, thin, easy to carry case and they have an adjustable bridge which allows you to customize the fit to your face size. They are prescription quality frames and we offer them not as pre-made readers, but with our premium lenses and options. Need prescription lenses? You can do that too. FREE! Each Slimfold order comes with our Eyeglass Screwdriver Keychain so you can keep the screws nice and tight. With proper care these should last a lifetime! Frame Material: Folding Metal with Case. A half-eye style frame. Fit: Small to medium depending on how you adjust the bridge.